In simple terms, a toaster oven is a hybrid between the two machines, designed to handle your toasting and baking needs on a smaller scale. Industrial ovens are universally expensive and unless your home or apartment comes with one, they’re probably not high on your list of purchases. Toaster ovens are more accessible and affordable for the budget consumer. You won’t be able to bake large platers of course, but it may be a good idea to split a meal into smaller portions so they fit in the toaster oven. 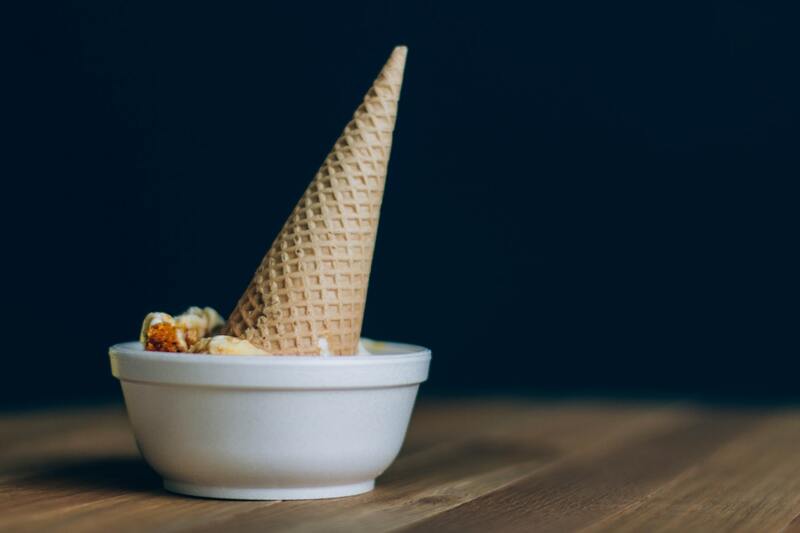 Convection–A process that uses fans and heating elements to warm up the air around something (food). Stainless Steel–Metal with resistance to oxidization and rust. Obviously, you’re going to be able to cook more diverse meals with a toaster oven. In reality, the toaster is only good for sliced goods like bagels and bread. A regular toaster will always be cheaper and will still have options for how to toast your bread. A toaster oven will be able to do the same and more. The best part is that your meals will be fully encased when they’re baking. Microwaves and Toaster Ovens are pretty similar. The major difference is how they heat food. 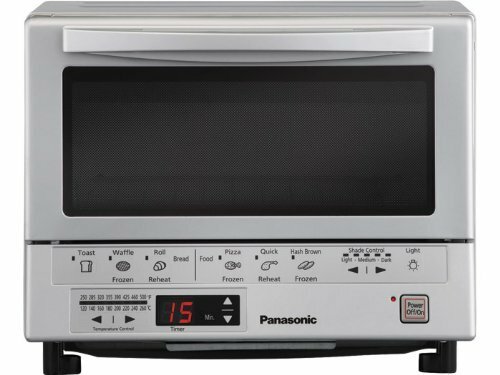 Microwaves use radio waves to heat certain parts of food while toaster ovens envelop food in warm air. Despite this small difference, there are certain things you can do with toaster ovens that you can’t with microwaves. Think of a microwave as a refresher. There are few foods that you want to eat cold, and the microwave simply heats things up for you. If you already have a meal prepared, you’ll likely use a microwave for a quicker heat up. 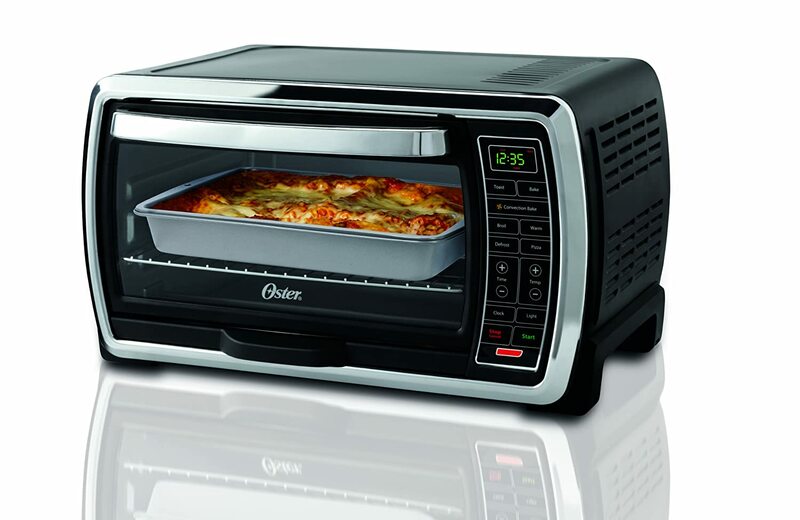 The Oster 6-Slice Oven is our choice for one of, if not the best toaster oven on the market. By 6-slice, we usually mean enough space for around 6 slices of bread or even bagel depending on the size. The glass is see through so you’ll be able to watch the baking unfold. Its internal bay measures 19-1/2in by 14 by 11, so it can fit moderately sized pizzas and just about anything you can fit in its two trays. It has an adjustable broil feature so you can crank up to the heat to around 500 degrees or bring it low for your ideal meal. For its price, the BLACK+DECKER convection oven comes with a lot of amenities. It has one of the largest oven bays compared to ovens in its price range. Depending on how big your slices are, you can fit a maximum of 8 pieces of bread in the interior. One thing to make note of with this oven is that the actual temperature will be slightly lower than what you set the meter to. 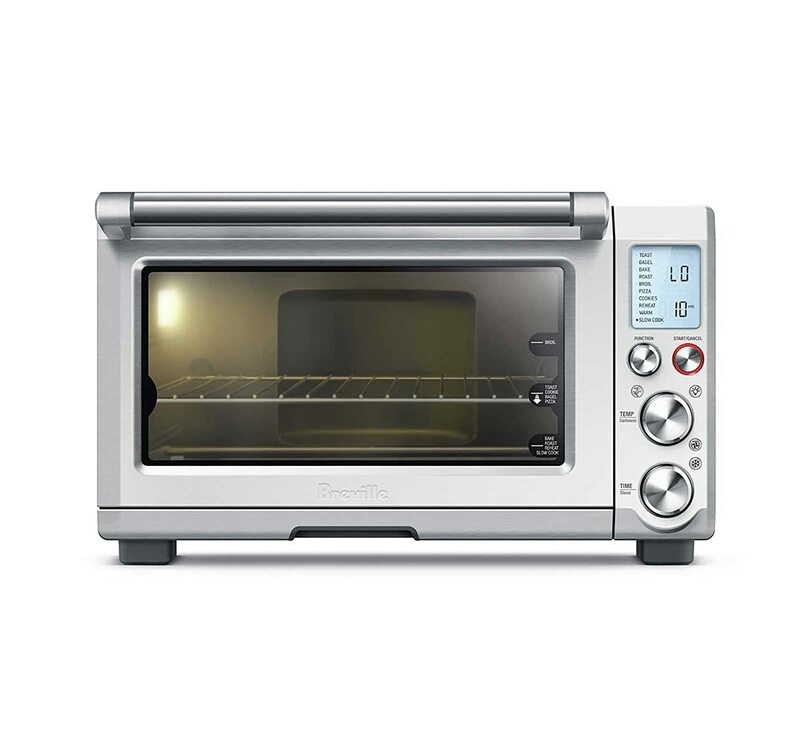 This oven comes with a couple of meters that give you almost complete control over the baking/toasting/cooking process. It’s not like you can keep something warm forever, but you’ll be able to control the timers and temperature more efficiently with the BLACK+DECKER oven. This 4-slice oven by BLACK+DECKER is the cheapest oven on our list. It may not be very big, but it comes with basic toasting, broiling, baking, and warming features that make it worthwhile. It is capable of fitting four slices of bread or 9-inch diameter circular trays. Like most ovens of today, it comes with a removable crumb tray for any bits that fall to the floor of the oven during heating. With only three dials to control the type of cooking and temperature, it takes the cake for being one of the simplest ovens on the market. 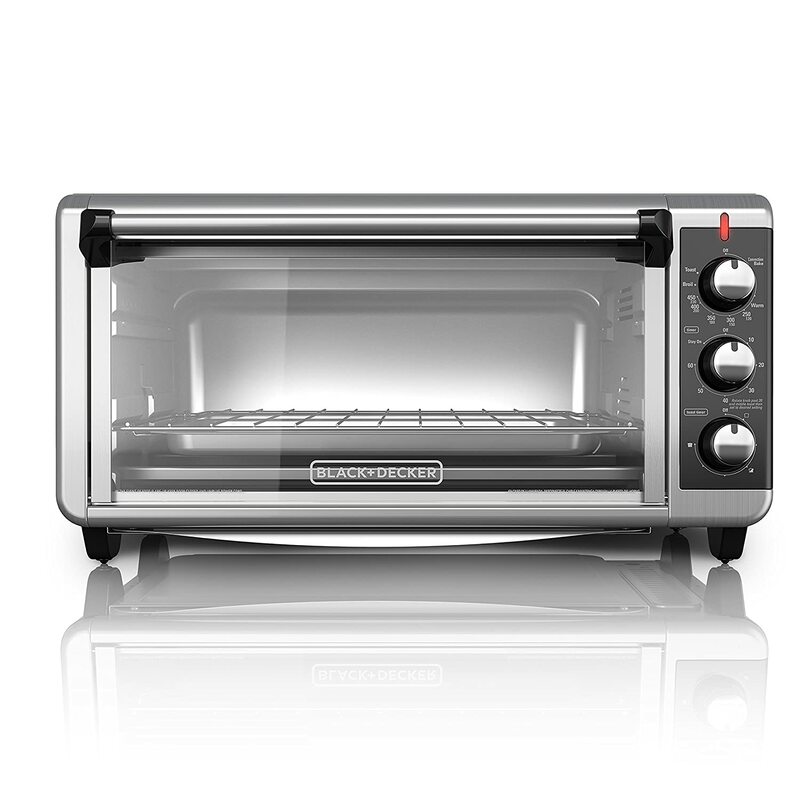 The Hamilton Beach Easy Reach is another simplistic convection oven with 2 rack positions and a thirty-minute timer. With a moderate price below $100, it’s easy to see why it’s so popular. You can switch heating methods between convection and baking, which will help some foods cook better and faster. For its price, the oven itself is actually pretty large, able to fit six slices of bread or fit a 12-inch pizza. This convection oven may look like another cheap machine but it is anything but. 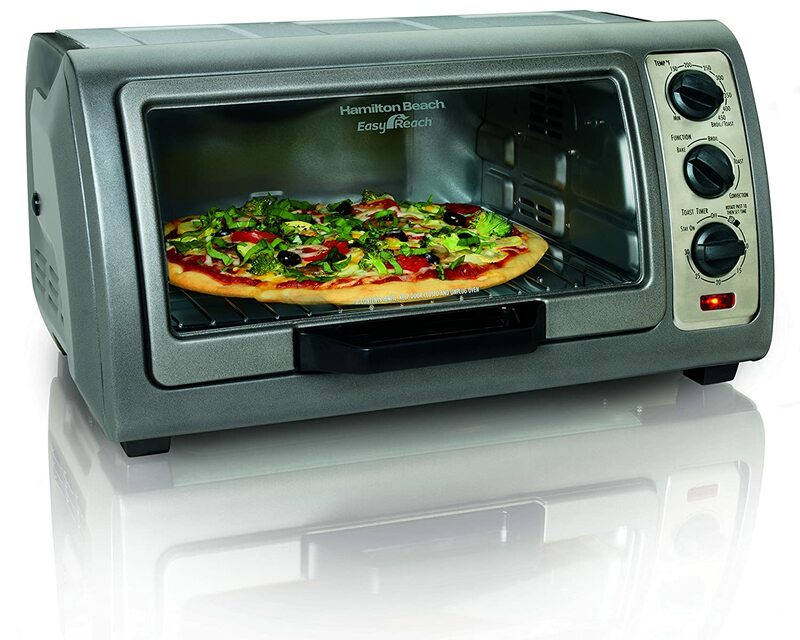 It can hold 6 slices and your standard 12-inch pizza as a convection oven. The real kicker comes with its 10 different cooking methods in 3 rack positions. If you want to be sure that you’re food comes out the best quality, then the hOmelabs convection oven is the machine for you. The Panasonic Flash Xpress isn’t your typical oven. It’s not even a convection toaster oven to begin with. It uses two layers of infrared light to heat and broil food at a faster pace than convection ovens. The interior lights up similar to a microwave, so you’ll still be able to see your food inside, just not as clear as glass window. Below the oven door is a variety of controls you can use to cook specific foods and regulate the temperature. To give you an idea of what it can hold–pizza up to nine inches in diameter and four slices of bread. That doesn’t really seem like much but when your meals are broiled and heated faster than any oven around, you’ll understand that it’s so worth it. Breville’s mini oven comes with Element IQ technology, giving you the ability to adjust the cooking features in real time to make your meal ideal. It has a larger cooking bay to fit larger pizzas and trays, but can still only fit four slices of bread. This oven radiates heat on the exterior, so we advise not to place anything on top when you’re using it. There are three ways to rack food inside the oven, giving you a small but noticeable addition to the ways you can cook food. 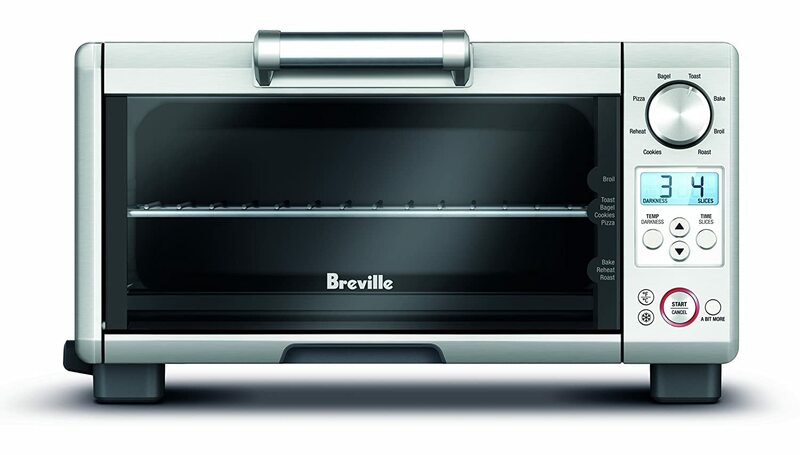 Breville’s next convection oven has a much larger cooking bay, able to hold up to 6 slices of bread and a circular dish up to 1.1ft in diameter. This oven comes manufactured with non-stick coating which will save you money on non-stick spray in general. 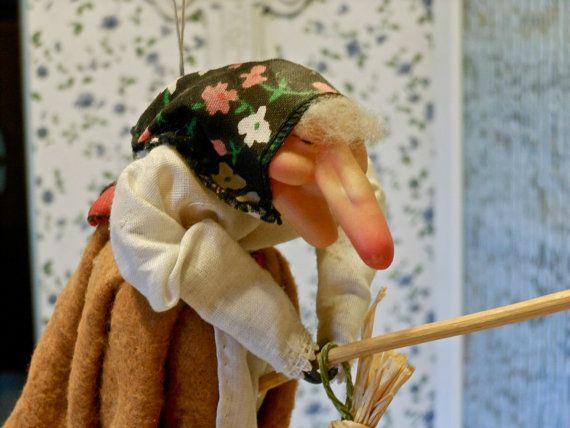 In the event the interior walls of the oven do get dirty from all that use, you’ll have a much easier time cleaning. This smart oven comes with easy to use controls and different trays and pans with which to cook your meals. Cookies are most likely to go in trays while bread and pizza go on the open racks. Toaster ovens become more advanced with each passing day, giving you more options to cook different styles of meals. While the purpose of a toaster oven seems simple enough, there are rarely two toaster ovens that are exactly the same. On one hand, you have the mainstream ovens meant for cooking family dinners. On the other, you’ve got the budget toaster oven. Which do you get? 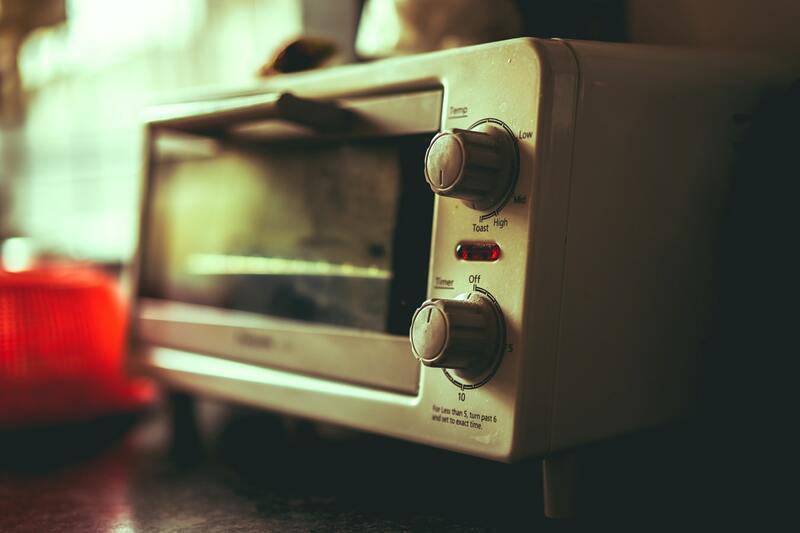 If your apartment or home comes with an oven, you shouldn’t feel pressured to get a toaster oven. A built-in oven does take longer to heat, bake, etc. In a way, your decision on a built-in or toaster oven depends on your housing and cooking needs. It’s not uncommon for those living alone or with one other partner to cook large-scale meals, however. 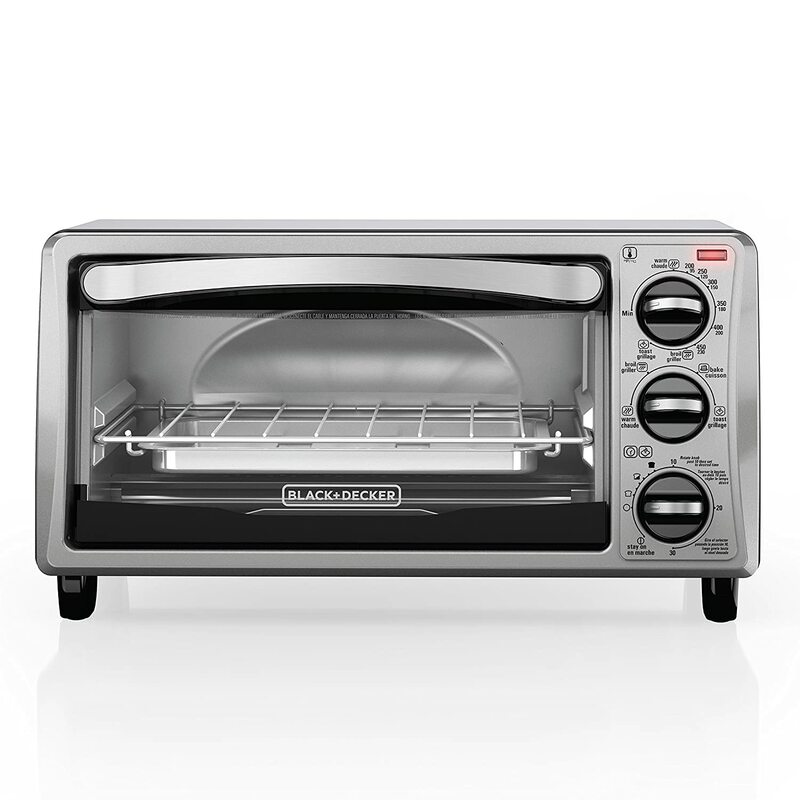 Overall, the toaster oven is the ideal machine for smaller meals, or larger meals split into smaller portions. Some of these might be able to fit a turkey or large pizza in, but that’s up to you. This is a really good point, Julie. The research on many of the current nonstick materials is inconclusive, with much of the older, more dangerous toxic chemicals having been discontinued. There are guidelines for actual cookware, as the problem there lies with cooks overheating nonstick pans, which then releases potentially harmful chemicals. Still, many folks are rightfully worried and try to stay away from ALL nonstick, and it’s strongly encouraged to avoid them if you have birds in the house. 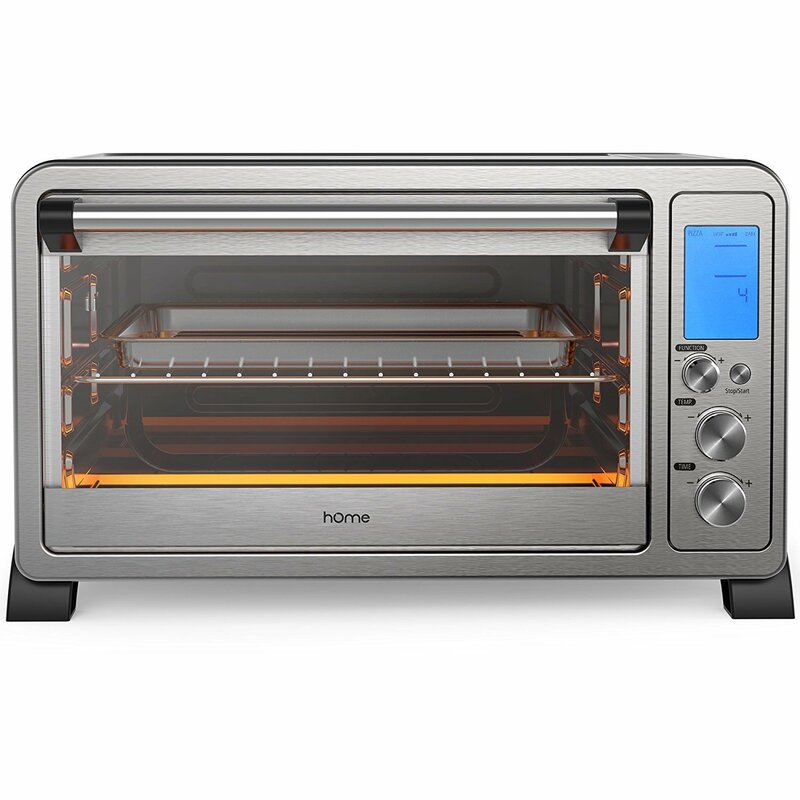 It’s very difficult to find toaster ovens without nonstick interiors, and in fact I’m not sure of any right now (some that I found discussed in other blogs are no longer available). Adding to the problem is that many manufacturers are not forthcoming about the interiors and what their coatings are made of. I found numerous blogs, comments, and product questions that talk about customers trying to get answers from manufacturers. Having said that, I’ll definitely do some more research and see if I can find some viable options! There have to be some toaster ovens with stainless interiors that have fair prices and decent reviews.